The English Hexapla (pronounced “HEX-UH-PLA”) because it gives you all six of the most important ancient English translations of the scriptures in easy-to-compare parallel columns, with the original Greek at the top, and a 160-page detailed preface telling the story of how each translation led to the next. From 1380 through 1611; it’s all here. This treasure should truly be part of every Christian’s library. The English "Hexapla" (from the root word "hex" meaning "six", such as a six-sided "hexagon") was printed in 1841 by Samuel Bagster and Sons of London, England. This wonderful resource of textual comparison is something no Christian's library should be without. Original rare printings of the 1841 Hexapla can sell for several thousand dollars. This book has become our most popular facsimile over the past few years. 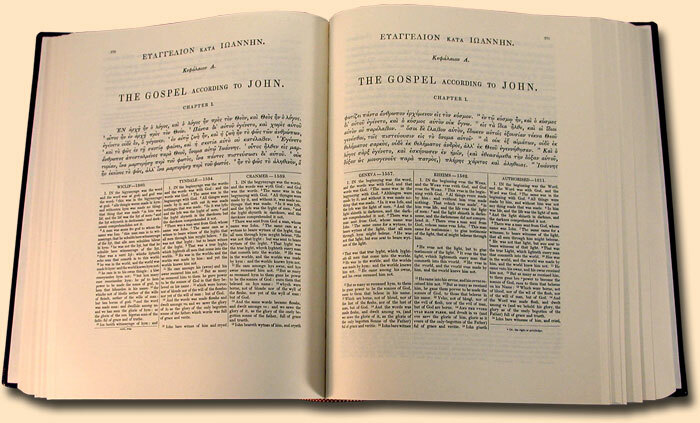 The English Hexapla Parallel New Testament has been called "a Bible collection in one volume." An excerpt of John 3:16 from the Hexapla is featured near the bottom of our English Bible History Page. What makes this book so special? It contains the six most important English language translations of the New Testament, all arranged in parallel columns for easy textual comparison of any passage. Each left-hand page shows: The Wycliffe version of 1380 (the first English scripture), The Tyndale version of 1534-1536 (the first English printed scripture), and Cranmer's Great Bible of 1539 (the first Authorized English Bible). Continuing across each right-hand page is: The Geneva “1557” - translation actually completed in 1560, (the Bible of the Protestant Reformation), The Rheims 1582 (the first Roman Catholic English version), and the 1611 King James First Edition... all side-by-side, and also laid out so the passages roughly match-up top-to-bottom as well. View Greek Parallel Bible materials available today.